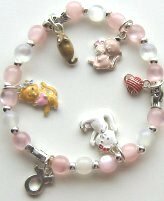 Here is a little pink and white beaded stretch charm bracelet. It includes three kittens, a mouse and a ball of yarn. It is 6" long but it stretches open another quarter inch. Lead and nickel free.